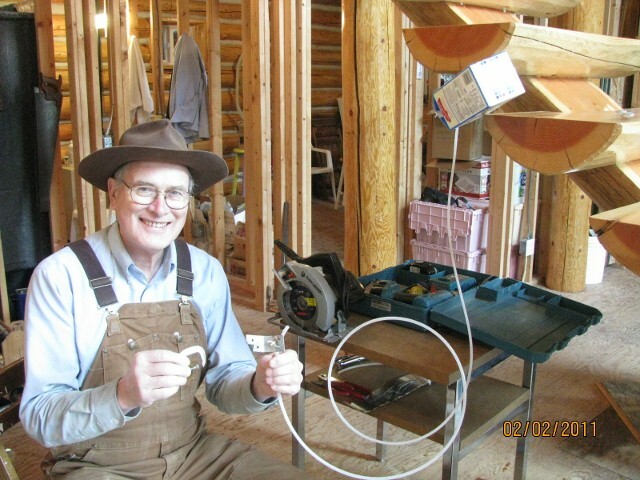 The major projects accomplished in 2011 were to install smoke detectors, move the wood stove, install drywall, bathroom and entry room flooring, hang the bathroom door, utility and bathroom cabinets, painting, a start on ceiling installation, and a start on fixing the drainage problem behind the cabin. 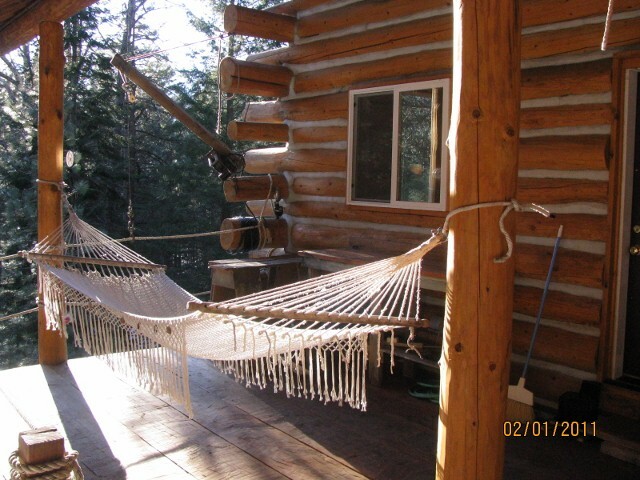 2/1/11 Here is the hammock given to us by Paul and Paula. We can hang it on the porch like it is here or we can hang it in the loft. 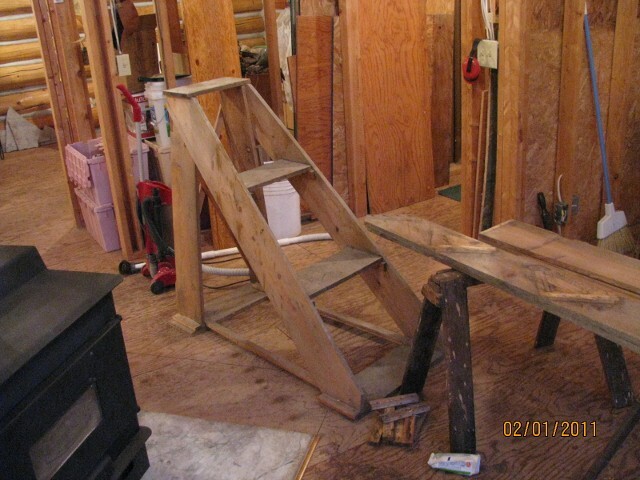 2/1/11 This is one of the scaffold steps used during the construction of the log walls. They were being dismantled here to salvage the boards and to make room in the closet. 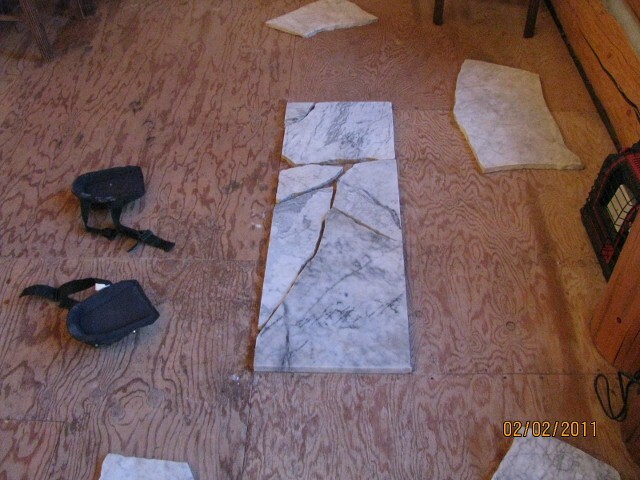 2/2/11 Here the selected pieces of marble are laid out to be marked for cutting. 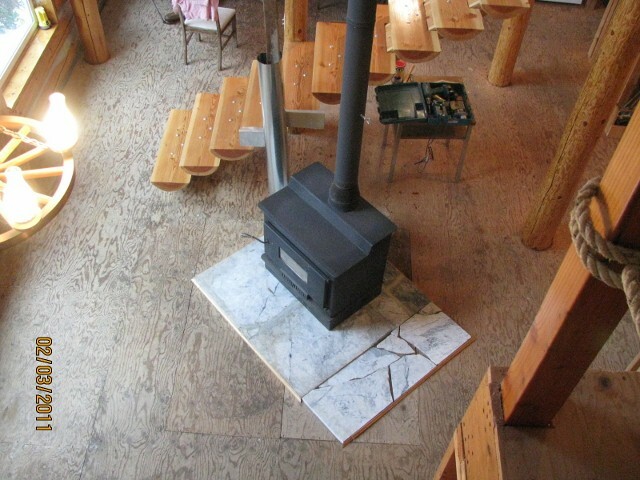 They will make the extension to the hearth so that the wood stove can be moved. 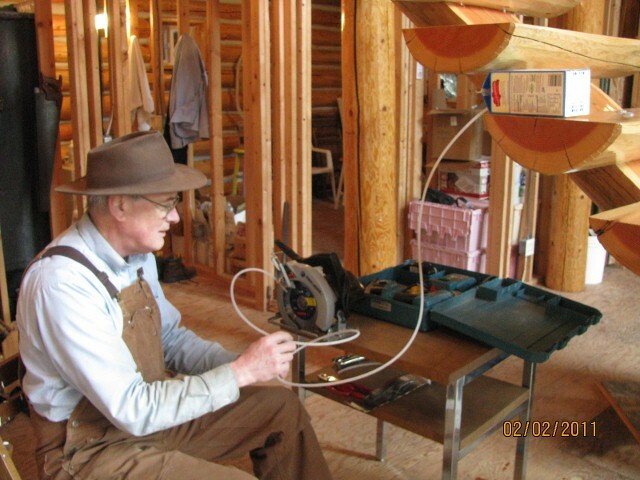 2/2/11 This is Paul making the water sprayer for the saw prior to cutting the marble. 2/2/11 Paul with the water sprayer connected to the saw. 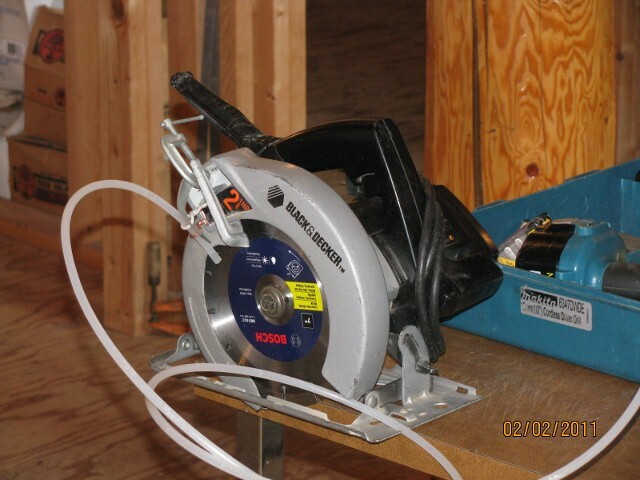 2/2/11 Close-up showing how the sprayer is connected to the saw with a small C-clamp. 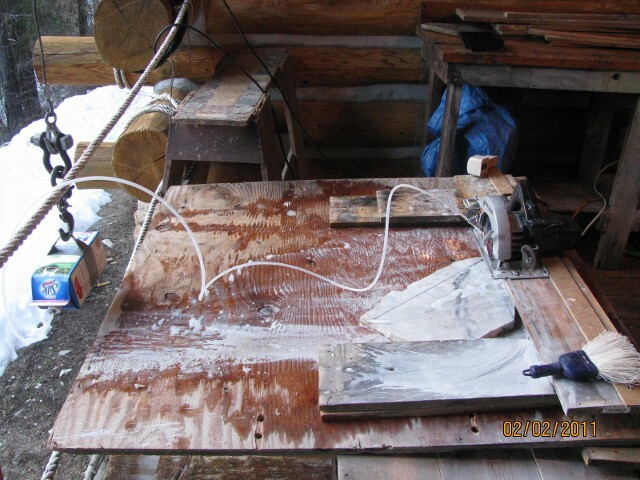 2/2/11 Here is the saw in operation on the sawing table. You can see the soymilk carton water reservoir suspended from the porch crane hook so that it can easily be raised and lowered to control the flow of water. 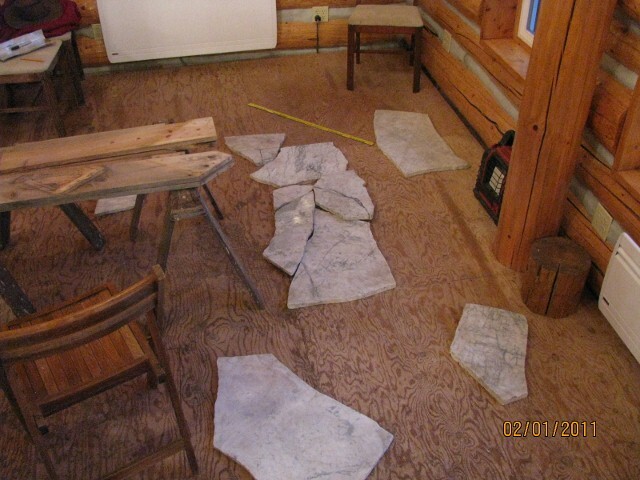 2/2/11 Here the marble pieces have all been cut and are arranged in position to form the hearth extension. 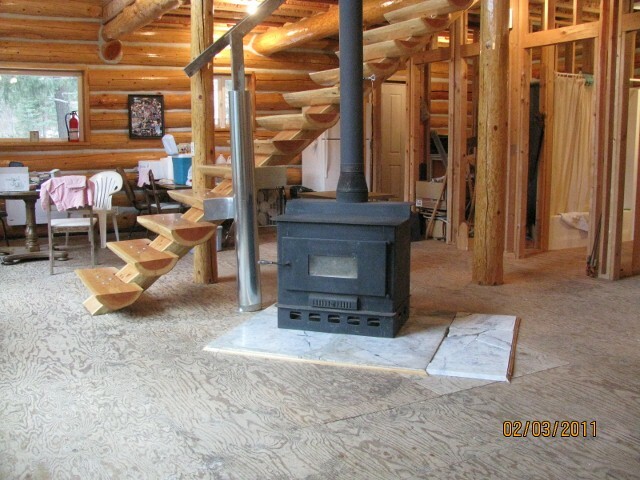 2/2/11 Here we see the hearth extension in place as viewed from the loft. 2/2/11 Here we see the hearth extension in place as viewed from the living room. ©2011-2019 Paul R. Martin, All rights reserved.